Buick used the Gran Sport or GS moniker on their fastest cars. The most famous of those cars was the Skylark Gran Sport or GS, which was Buick's answer to Pontiac's GTO and Oldsmobile's 442. They also used the GS name on a high performance Wildcat, and this car, a Buick Riviera. The Buick Riviera GS is a massive car. It's 211" long, (To put that in perspective, a 2009 Hummer H3 is "only" 188" inches long) 78" wide and has a wheelbase of 119" (The Hummer's wheelbase is 111"). It weighed over 4300lbs. Despite all that heft, the Riviera GS, with a 425-cu V8, was able to hit 60 MPH in somewhere between 7 and 8.5 seconds (Times vary depending on the source). There's no real point in talking about handling. This is a straight line fast car, not a mountain road tourer. The seller states, "This is a real matching number Z code GS one of only 179 cars produced in 1966. For those of you that are not familiar with the coding in 1966 Buick decided to come out with a FACTORY Dual Quad option and the designated code was Z for dual quad Super Wildcat option. It was only made available for approx. a 6 week run in February to March so only a 179 of these cars were built. This makes these the rarest and most sought after by GS collectors." This is not the type of car I'd buy. I appreciate it for what it is, though. Maybe if I were a bit older and had been able to buy this car (or some of the other muscle cars I featured recently) when they were brand new, I'd appreciate it more. That could be the crux of GM's problem. By the time I could realistically afford to buy a new car, GM was selling the X-body car and other equally boring cars. The days of GM making interesting cars was over. I (and a good portion of my generation) looked to Europe and Japan for interesting and funs cars. We found them and never looked back. 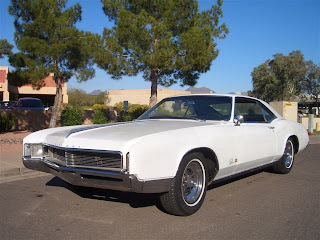 Click here to see the eBay listing for this 1966 Buick Riviera. Click here to see a Hemmings article about the 1966 - 1967 Buick Riviera GS. You are right regarding GM and losing the generations of buyers. However I'll stand by the statement that they almost did it back in the Citation X/11 and STE days. They just gave up too early. Citation back then. He was an engineer for GE and used to give me a ride to school in his Sway bar and Koni lowered 77 Celica. I thought that car was the coolest. Looking back, it was a nice car with black interior and dark green paint..... Anyway. One day he tells me he's buying a new car! What ya gonna get? 911? Scirocco? GTi??? "No I'm getting a Chevy Citation." WHAT!!!!!!!!!!!!!!!!!!!!! He re-assured me that it will be ok. I wasn't sure. His Citation was not an X/11 but it had all the X/11 stuff. This was back in the day when you could order a la carte. It had so many differences from the other Citations that the old people drove. The list is what I can remember. Ask Jeff, He will know of my strange love for this car. 4 speed transmission (same as an X/11) High Output 2.8 V6. I don't remember the HP but does 165 sound right? Some sort of headlight and tail light package. This caused it to have slightly different turn signals, grill, front and rear turn signals. Rear orange turn signals. Front "Rally" bucket seats.Little itty bitty front spoiler under and behind the front bumper. AC. Stainless steel "Rally" exhaust system. driveway where it slowly rusted away in Williamstown. So Here was this car, GM went and dumbed it down with the X/11 stickers and tried to copy ... who knows who with their "Euro Look". This was a great attempt to combat the rest of the world, but they slacked on the rest of everything and of course the rest is history.